Failure to comply with regulatory statutes will be costly, embarrassing, and will also increase your liability. Everyone is sensitive to environmental issues. The government requires that we be responsible and our clients demand that we are responsive. Goodwill and a good image must be earned, and the best way to keep them is to develop a positive and ongoing environmental strategy now. Your strategy should include promotion of your business as environmentally friendly and employee environmentally responsive. Under our "CLEAN" program, S&ECC will bring your business into compliance and keep you in compliance by providing all written materials. 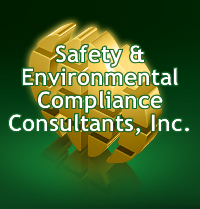 providing information and assistance in the complex area of Environmental, Health, and Safety Regulations, both Federal and State, including OSHA, USEPA, DOT, RCRA and SARA Title III. In other words, we put you in compliance and keep you there. Some companies simply provide "how to" guides, or "one size fits all" generic programs. Lawyers or Engineers will offer to come on-site, but their billings often exceed the amount of the potential fines they save. In either case, they will do their work, collect their fee, and the client is in compliance as long as he keeps himself in compliance. S&ECC CLIENTS REMAIN IN COMPLIANCE through regulatory updates, program revisions, training provision, updated chemical inventories and MSDS's, regular on-site inspections and consultations. help with submission of all required reports, and professional representation before regulatory agencies if needed.